At seventy years of age Abram and 318 of his best men went out to rescue his nephew Lot who had been kidnapped and taken as plunder. 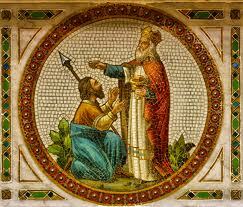 After defeating several nation’s armies with relatively few men, he is met in a valley by a priest name Melchizedek. We do not know much about this man other than “He was priest of God Most High.” Abram recognizes the priest’s ties to God, and presents to him a tenth of all that was gained as a result of the conflict. Why does Abram give Melchizadek a tithe of what was gained from the conflict? 1) He is affirming the priest’s words that what he had is from the hand of the Lord. It was the Lord that allowed him with 318 men to defeat vast armies from multiple countries. We tithe therefore to recognize that the words the priests of God are true — we affirm their words by giving. The gathering of the Church in regular worship and teaching should be a place where hearing and learning the truth of God is paramount. We recognize the importance of this truth in our own lives and in the life of our community by tithing. It is shameful for churches that accurately and faithfully teach and preach the Bible to not be able to pay its bills because the membership have placed other priorities in their lives. God’s truth must be proclaimed around the world, and it is the local church’s resources that God uses to mobilize this effort. When we do not tithe we are not affirming the truth within our churches (talk Â is cheap), and we are not recognizing that it was God who gave it to us in the first place. If you cannot support what is being taught in your church, then find another church. If you believe that all you have is because of all of your hard work, then you are blind to those truths being taught by your priests.